Poncha Springs, Colorado is a quaint, small town located in the heart of the Rocky Mountains near the center of the state. Located in Chaffee County, just west of Salida and east of Monarch Ski area, Poncha Springs is often called the “Crossroads of the Rockies”. There are nearly 100 hot springs around Poncha Springs, and the town is known for its access to a large number of outdoor activities that can be had in the region ranging from skiing, rock climbing, and mountaineering to rafting, fishing, and dog sled rides. The area known today as Poncha Springs was first inhabited by the Ute Indians well over 250 years ago. The Ute used the area for hunting and camping grounds. Spanish explorer Juan Batista de Anza led a military expedition over Poncha Pass in 1779, marking one of the first known recorded dates of other travelers in the region beyond the Ute. In the years to follow, French trappers and fur traders are known to have settled in the area. In 1806 Lt. Zebulon Pike spent Christmas day in the area, and Kit Carson was noted to have passed through Poncha Springs in 1832. Preceding the first homesteaders of this area, Colonel Thomas T. Fauntleroy led an army out of Fort Massachusetts to engage the Ute Indians in 1855 between Salida and Poncha Springs. In the early 1860s prospectors arrived, two of which, Nat Rich and Bob Hendricks, built the first cabin in Poncha Springs, which still stands today. Rich’s son James was the first white person documented as being born in Poncha Springs in 1867, the same year the area was designated an election precinct. In the mid-1870s the town saw a boom in construction, with the town incorporating in 1880. The building of the railroad that same year attracted settlers and the population grew to over 2000 in those years. Sadly, a major fire in 1887 destroyed many of the wood framed structures. The town seemed to be plagued by structure fires off and on for years, but one building that still stands is the Poncha Springs Schoolhouse. The schoolhouse was built in 1883 and today serves as the city’s town hall and museum. The hot springs were a popular attraction for years in Poncha Springs, bringing many notable visitors to the area to include Ulysses S. Grant and Jesse James. Eventually Donald Hartwich took over the springs and ran them until 1935. 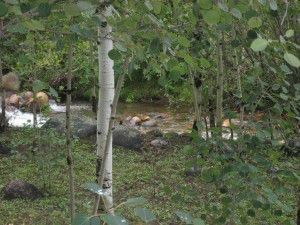 Shortly thereafter, the springs were capped and the hot water pumped to Salida, which has owned the springs ever since. Today the quiet town of Poncha Springs is supported by farming and tourism and offers residents and visitors a glimpse of the natural beauty that makes up the Rocky Mountains. A great destination for outdoor enthusiasts and wilderness adventurers, Poncha Springs and its surrounding communities offers many a wealth of activities and is known for its hospitality.